How to Lie With Statistics is an old and good book on how not to be fooled by statistical tricks. I just came across one that, so far as I can remember (I read the book a long time ago) was not not included. 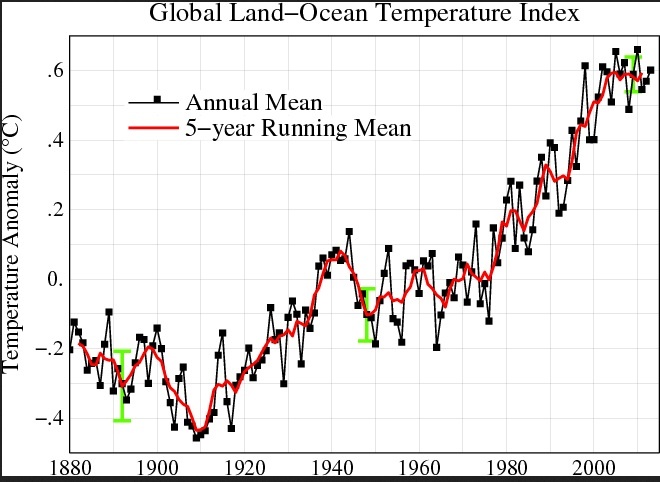 Someone commenting on a Facebook global warming post put up this graph. Two comments later he wrote "Notice a trend?" The trick, of course, is that the years are arranged in order of how hot they were. 2014 is at the right end not because it is the most recent year but because it was the hottest. 2012 is at the left end because it was the coolest of the years shown. Arranging them that way guarantees the appearance of a rising trend, whether temperatures are actually going up or down. I am not certain that the person who put it up intended to imply that it showed a trend. He may have only meant that 2014 was hot and 2015 expected to be hot, as mentioned in his comment immediately after he put up the graph. But my guess is that either he had been fooled by the trick of drawing the graph that way or else he was deliberately trying to fool others. I commented on it in the thread and will be interested to see his response. Scott on Slate Star Codex sometimes posts a collection of links with brief comments. I thought I would try it. According to Bloomberg, the FBI has succeeded in recovering some of the emails on the server that was supposedly wiped before handing it over to them. The reason this is a news story is that it might provide evidence against Hilary, emails that should have been turned over and were not because they contained information she did not want to get out. But whatever is on the server, the fact that the FBI was able to recover it is relevant to Hilary's qualifications to be president. Anyone living in the modern world and using computers should know that erasing a disk does not guarantee that the contents cannot be recovered. Even if she does not know much about computer technology, she ought to have people working for her who do. If she does not, that is evidence of incompetence, not in wiping a hard drive but in hiring and managing subordinates—a large part of a president's job. The first announcement of nuclear winter appeared in an article by Sagan in the Sunday supplement, Parade. The very next day, a highly-publicized, high-profile conference on the long-term consequences of nuclear war was held in Washington, chaired by Carl Sagan and Paul Ehrlich, the most famous and media-savvy scientists of their generation. Sagan appeared on the Johnny Carson show 40 times. Ehrlich was on 25 times. Following the conference, there were press conferences, meetings with congressmen, and so on. The formal papers in Science came months later. Part of the reason I agree with his point was an article I read at the time, written by one of the teams whose work fed into the nuclear winter conclusion. They conceded that a criticism that had been offered of their work was correct, concluded that fixing the error would reduce the length of nuclear winter from years to weeks. But they also found another mistake in their initial work with the opposite effect. Fixing that got it back to years. There is nothing surprising or disturbing about the fact that published scientific articles sometimes have mistakes. I am currently in the middle of redoing an old project, my research on Icelandic law, and have concluded that at least some details in what I published more than thirty years ago were wrong. But there is a problem with proclaiming something as scientific fact before other people have had a chance to look at your research and critique it. One interesting thing about that particular case is that it might be defended as a case of justified dishonesty. I can imagine a reasonable person deliberately misrepresenting the evidence, claiming it was much stronger than he believed it actually was, on the grounds that almost anything that reduced the risk of nuclear war, honest or dishonest, was worth doing. The counter-argument is implicit in Crichton's essay—that treating science in that way converts it from a mechanism for determining truth to a tool of partisan debate, with very bad long-term results. I am no fan of Coulter and enjoyed the essay, but with two reservations. The first has to do with the tweets. The reference to "f—ing Jews" is not about ethnicity. The implied point was that candidates focus on support for Israel to attract support from Jewish voters, and there aren't enough Jewish voters to make it worth doing. It is abrasively put, but it implies nothing about her view of Jews other than their numbers. The point is, however, wrong—not because there are a lot of Jewish votes but because winning Jewish votes is not the reason the candidates talk about Israel. American conservatives are mostly pro-Israel for reasons that have nothing to do with their view of Jews, just as the American left is mostly anti-Israel for similar reasons. Republican candidates are trying to appeal to conservative voters; trumpeting their support for Israel is one way of doing so. "It is our whole complaint against the Jew that he does not till the soil or toil with the spade; it is very hard on him to refuse him if he really says, 'Give me a soil and I will till it; give me a spade and I will use it.' It is our whole reason for distrusting him that he cannot really love any of the lands in which he wanders; it seems rather indefensible to be deaf to him if he really says, 'Give me a land and I will love it.'" Some years ago, Richard Tol published an article in the Journal of Economic Perspectives that pooled the work of everyone in the field to produce estimates of the net effect of various levels of warming, measured relative to pre-industrial temperatures. It included a graph showing estimated net cost, with an error range. The green lines show his results after correcting some errors in the original paper. The solid green line shows the estimate. It is positive up to about two degrees, negative thereafter. The dashed lines are the boundaries of the 95% range. The high end (optimistic) does not go negative until 3°C. What about the low end? At 3°C, the welfare impact is a reduction of 10%. The IPCC high emissions scenario, RCP8.5, which gets us to that temperature sometime in the second half of the century, assumes continued economic growth. If so, the 10% reduction in welfare due to AGW will be combined with an increase several times that large. My previous post discussed an article in the Journal of the National Academy of Sciences which criticized the IPCC models and concluded that warming due to AGW had been reasonably stable for the past century at a little less than one degree/century. If that continues, by 2100 global temperature will be less than two degrees above its preindustrial level. On Tol's estimate, we will be better off than if there had been no AGW, worse off than if AGW had been a little slower. If, on the other hand, we accept RCP8.5, when we reach the 3° mark we will be worse off than if warming had not occurred, better off than we are now—even if we take the low end of Tol's predicted range of effects. Which I think is an adequate response to people who tell me that to deny catastrophic effects of warming is to ignore the scientific consensus. A recent discussion of a post on my favorite blog dealt with the implications of smart drugs, in particular modafinil. A number of people argued that the problem with permitting such things was competition. If one person uses them, others have to use them in order to compete with him, so you end up with whatever negative side effects the drugs have—modafinil does not seem to have many, but nobody knows for sure—and everyone in the same position as before. That argument views economic competition as something like a football game, where one side wins and the other side loses—if you are not the best you are nothing. If that were true, most of the population of the world would be unemployed. Even without smart drugs, people vary in how able they are—they cannot all be the best. Suppose the use of modafinal makes me 10% better at whatever I do. The result is not that someone with the same abilities who does not take it is useless, merely that I am ten percent more useful and so can expect an income about ten percent higher, whether my salary as an employee or my earnings if I am self-employed. I can decide for myself whether the additional income, or the additional leisure if I choose to work fewer hours instead of making more money, is worth whatever I think the risks of side effects are. If many people use smart drugs, some of the benefit might to go to other people either as lower prices for what the more productive workers produce or higher returns on other inputs to production. But somebody still gets the benefit of the additional productivity. The source of the mistaken intuition is probably the analogous case of steroids in sports. There the right answer is less clear, depending on what it is that athletes produce. If what the fans care about is only relative ability, whether or not their team can beat the other team, then if everyone uses steroids the players are worse off—assuming significant negative side effects—and the fans no better off. If fans value absolute quality, enjoy watching athletes more the better they are, then the argument I have offered applies to that case as well. Not being a sports fan, I cannot offer an informed opinion on which is the case. Which, fortunately, is not true. I have been arguing for some time that what the pattern of global warming suggests is a rising trend due to AGW with an alternating trend from some other cause superimposed on it, the latter having a period of about sixty years. On that interpretation, the period of stable to slightly falling temperatures from about 1940 to 1970 and the period of roughly stable temperatures from 2002 on represent periods when the two trends were pushing in opposite directions and so roughly canceling each other, the rapid warming from about 1910 to 1940 and 1970 to 2002 periods when they were reinforcing each other. The conventional explanation for the mid-century pause is that it was due to aerosols producing a temporary cooling effect. That became less plausible, at least to me, when the pause reappeared, roughly on schedule. If I am correct, the IPCC models, by special casing the earlier pause instead of treating it as part of a recurring pattern, overestimated the average rate of warming, treating periods when the two trends reinforced as if they were the norm, the period when they canceled as a special case. The underlying net anthropogenic warming rate in the industrial era is found to have been steady since 1910 at 0.07–0.08 °C/decade, with superimposed AMO-related ups and downs that included the early 20th century warming, the cooling of the 1960s and 1970s, the accelerated warming of the 1980s and 1990s, and the recent slowing of the warming rates. Almost precisely my conjecture—I slightly underestimated the period of the oscillation—with an explanation and a lot more data. Various people, including Donald Trump, have suggested that Obama was not born in the U.S. and may be a Muslim. The former claim, while it may be false, is not absurd—there is no obvious way of being certain of the details of the birth more than fifty years ago of someone of no particular prominence. The claim he is a Muslim, on the other hand, has at least two serious problems. One of the binding obligations of Islam is to pray five times a day, in a specified manner (with some possible variations), at specified times. If Obama has managed to do that through most of two terms without anyone noticing, he is a very talented man. A second binding obligation is to fast through the month of Ramadan—neither eat nor drink in daylight hours. My preferred candidates are Rand Paul for the Republican party and Gary Johnson for the Libertarian Party, but the candidate I find most interesting at the moment is Ben Carson. I do not think he is likely to get nominated, let alone elected. But if he did end up in the White House, what kind of a job would he do? He is intelligent and likable, both useful assets, but he has no experience at anything close to the job he is running for. There have been Presidents before with a background outside of politics, such as Grant and Eisenhower, but both were generals, men who had successfully run large organizations. Have there been any Presidents like Carson, successful men whose success did not involve either politics or administration? None occur to me—but it is not a subject I know much about. Perhaps one of my readers can offer an example. The job of president is, long has been, too big for one man, so the question will be how good he is at building and running a team. Can he select competent subordinates, coordinate them, evaluate the advice they give him? Judging by my one first hand experience of neurosurgery, that too is a team job. But I have no idea whether Carson as surgeon was the creator and leader of a team or merely its star member. If he does make it, it should be interesting. A correspondent recently emailed me links to a couple of YouTube videos from a firm that trains people in the use of modern weaponry, with the suggestion that it might be more relevant to the discussion of how a stateless society could defend against states than the example of paintball that I offer in a chapter in the new edition of The Machinery of Freedom. The first video included a discussion of a technical point new to me, the distinction between open bolt and closed bolt firearms. After the video finished, I went downstairs to tell my younger son about it. Bill is unlikely to ever have any use for an open bolt, or even a closed bolt, firearm. He is, however, a would-be novelist, I think likely to be a good one, and almost any information is potentially useful in that profession—which is the point of the title of this post. Most modern firearms are closed bolt. When the gun is ready to be fired the bolt is closed, holding the cartridge firmly in place. Pulling the trigger releases the firing pin, which strikes the primer, which fires the gun. In the less common open bolt design, the firing pin is a fixed part of the bolt, not a piece free to move within it. When the gun is ready to fire, the bolt is open, pulled back. Pulling the trigger releases the bolt, which slides forward, closing the breach and driving the firing pin into the primer. That works fine, provided you are standing still. But with the bolt open, there is nothing holding the cartridge in place. If you are running around with the weapon ready to fire—not a problem with the closed bolt weapons you are used to—the cartridge can come loose, either falling out entirely or jamming the mechanism that is supposed to fire it. That is what happens in the video to a trainee using a weapon new to him. It could happen easily enough to a fictional character, providing both one more way in which the author can complicate the action and a nice technical detail to help the author pretend to know what he's talking about. Which is why I thought my son would be interested. If we burned all the coal, oil and gas that’s left in the ground, we’d melt Antarctica and global sea levels would rise as much as 60 meters (200 feet) over the next ten thousand years. Coastal cities from New York to Shanghai would wind up deep underwater. That sounds scary—if you miss "over the next ten thousand years." The article the news story is based on is webbed. It gives an estimate of the consequences of burning all of Earth's fossil fuel over the next few centuries. The conclusion is that "Antarctica is projected to become almost ice-free with an average contribution to sea-level rise exceeding 3 m per century during the first millennium." Figure 1d from the article shows a rapid rise, close to forty meters in the first thousand years, gradually tapering off thereafter. Three meters a century is considerably faster than the current rate of rise—not surprising since it would be driven by a CO2 concentration about eight times the current level. One way of getting a feel for how serious it would be is to convert it into a rate at which coastlines move inward, assuming no diking. The rule of thumb for that is about a hundred meters shift for every meter of rise. So three meters per century of SLR implies coastlines shifting in by about three hundred meters a century, more in some places, less in others, but well short of the catastrophe implied by "coastal cities deep underwater." Another way of looking at it is in terms of what could be done via diking. The lowest city in the Netherlands, a country with centuries of experience protecting land below sea level, is more than six meters below sea level. With two centuries to do it in, I expect New York or Shanghai could match that. Another conclusion of the article is that the Antarctic would end up almost ice free, but it is not clear why that would be a bad thing. We are currently in an ice age, defined by the existence of ice on the poles. There have been earlier ice ages, but for most of the history of the Earth, including most of the period with living creatures and even most of the period with mammals, the poles have been free of ice. Figure 1c shows the estimated effect on average global temperature—an increase over about a thousand years of a little over 10°C relative to the current value, followed by a gradual decrease thereafter. That looks like a much bigger problem than sea level rise—but how big? At the same time that the hotter parts of the Earth were becoming unihabitable, the colder parts—Antarctica and currently frozen parts of the Northern Hemisphere—would be becoming habitable. An accurate calculation of the net result would require more expertise than I have and more effort than I am willing to put into the project, but I can at least try a rough back of the envelope estimate. Warming due to CO2 tends to be greater in cold times and places than in hot, because water vapor is also a greenhouse gas, the warmer it is the more water vapor is in the air, and the more of one greenhouse gas the less the effect of adding another. I do not know how large the difference would be for warming on the scale I am looking at. To simplify my calculations, I will assume that high temperatures in hot areas go up by five degrees, low temperatures in cold areas by fifteen—readers are welcome to recalculate the numbers with other assumptions. How high do high temperatures have to be to make a place uninhabitable? India is a very hot place and densely populated. Looking at a list of July high temperatures by city, I observe a high of 36°C in Tamil Nadu and Pondicherry. If that represents the upper bound for habitability, another five degrees would make any city currently above 31° uninhabitable. Counting cities, which is less work than looking up regional areas and adding them, I observe that twenty-four out of fifty-two cities are above that, so my very rough estimate is that the projected warming would make almost half of India uninhabitable by a thousand years hence. Looking at a list of highest temperatures ever recorded by country, the figure for India is 50.6°. Algeria, Iran, Iraq, Kuwait, Mexico, Pakistan and Saudi Arabia equal or exceed that, and a few other countries come close. If I add up the area of India and all countries whose highest temperature is at least as high, I get a total of about 12.7 million square km. To allow for countries a little cooler than India, take it up to 14 million, then divide in half, since my very rough calculation suggests that only about half of India would become intolerably hot. Very, very rough estimate: A five degree increase in maximum temperatures would make about seven million square km intolerably hot. What would we get in exchange? Antarctica and Greenland would be ice free, for a total area of about sixteen million square km. How much of that would be warm enough to be habitable I do not know. Siberia is about thirteen million, Canada about ten million. Parts of both are presently habitable, but large parts are not. Similarly for Sweden, Norway, and Finland. I conclude, from my very rough estimates, that the total habitable area of the Earth would almost certainly go up, not down. I leave to someone more ambitious the task of a more careful and precise calculation. A lot of people would have to move—but a thousand years is a very long time. Why does all of this matter, given the difficulty of predicting anything a thousand years, even a hundred years, into the future? It matters because it suggests an upper bound to climate catastrophe, at least slow catastrophe. In the worst case, the long term result would be a physical world not strikingly worse for humans, possibly better, than the present world. If the changes happened over decades there would be enormous human costs. If they took many centuries, probably not. with a link to a news story about a "once in 50 years" rain in Japan. It is an argument I frequently see made, explicitly or implicitly. Lots of unlikely things are happening and there must be a reason. When the subject is climate change the unlikely things are mostly about climate. It looks convincing until you think about it. The world is large. There are lots of different places in it where, if an unusual weather event happens, it is likely to show up in the news. There are at least four categories of unusual weather events that could happen—unusually hot, unusually cold, unusually large amount of rain, unusually small amount of rain—and probably a few others I haven't thought of. A year contains four seasons and twelve months and a record in any of them is newsworthy—a recent news story, for example, claimed that this August was the hottest August in the tropics on the record. =16,640 opportunities each year for an unlikely weather event to occur and be reported. So we would expect more than 300 once in 50 years events to happen each year and about sixteen one in a thousand events. My guess is that those number are too low—the story about floods in Japan does not make it clear whether the one in fifty years record is for the whole country or only one region. But they at least show why we should expect lots of unlikely things to happen each year. If you flip a coin ten times and get ten heads, you should be surprised. If you flip sixteen thousand coins ten times each, you can expect to get ten heads about sixteen times—and should not be surprised when you do. One of the less sympathetic features of the case, at least to me, is that her action is entirely symbolic. It does not prevent gay couples from getting married and it only prevented them from getting married in her town for a few days. That makes me suspect, perhaps unfairly, that she is acting not out of religious conviction but either because she likes attention or because she hopes to use the controversy to jump start a political career. You are a law enforcement official charged with enforcing the law against marijuana in a state with severe penalties for its violation. You believe marijuana should be legal. You can quietly subvert the application of the law by failing to follow up evidence of marijuana usage, recommending on spurious grounds against prosecution of arrested users, perhaps sending anonymous warnings to targets of investigations by other officers. You expect that you can get away with such actions for many years, since those supervising you are either sympathetic or incompetent. The result will be to save hundreds of people from arrest, conviction, and imprisonment. Should you do it or should you resign? For those who think it obvious that you should resign, that obedience to the law takes priority over moral beliefs, consider two real world situations along somewhat similar lines. 1. Jury nullification. If you are on the jury trying someone for a crime of which you believe him guilty but that you do not believe ought to be illegal, should you vote for conviction or acquittal? 2. President Obama's decision not to prosecute a specified subset of illegal immigrants. The strongest argument against free immigration, from the standpoint of supporters of the free market, is that immigrants from poor countries may come not in order to work but in order to take advantage of a rich country's welfare system. Seen from one side it is an argument against free migration, seen from the other an argument against a welfare system. The easier it is for poor people to come to take advantage of welfare, the less attractive redistribution looks to the taxpayers paying for it, hence the less generous the system is likely to be. That may explain why levels of redistribution are generally lower in the U.S., where welfare was traditionally handled at the state level and intrastate migration was free, than in Europe, where welfare was handled at the national level and interstate migration was restricted. Was. Within the E.U., there is now free migration. That puts pressure on national welfare systems either to reduce the level of transfers or raise redistribution to the supranational level. That pressure was limited as long as all E.U. members were relatively wealthy countries, became greater with the admission of poorer members from eastern Europe. One way in which the E.U. might respond is by restricting immigration. That will be difficult when many of the would-be immigrants are fleeing real dangers, hence natural objects of sympathy. How do you distinguish real refugees from migrants seeking to take advantage of generous transfers (330 € monthly, accommodation, language courses and so on during the six months that it takes Germany to decide whether or not someone qualifies for asylum, according to a comment on a recent post here)? And immigration restriction is made more difficult by the fact that border control is done at the national level. A country with low levels of redistribution can leave its border open in the expectation that most new arrivals will promptly depart for richer fields. An alternative is to offer asylum on terms sufficiently unattractive so that only those fleeing real dangers will be inclined to take them—no welfare payments for five years, the current Czech policy for non-asylum migrants. That is the immigration policy that I recommended for the U.S., along with open borders, more than forty years ago in the first edition of The Machinery of Freedom. Either policy might solve the immediate problem but still leave a situation where rich E.U. nations with generous welfare policies can expect to attract poor people from poorer parts of the E.U.—who, under current law, have the same rights as existing residents. It will be interesting to see whether the result is to shrink the European welfare states or to shift redistribution one level up, converting the E.U. into something a little closer to a United Statues of Europe. For those in favor of free immigration and opposed to redistribution, the optimum solution, within the E.U. and in the world more generally, is easy. Arguably, the same solution should be optimal for those who support redistribution for egalitarian motives. Open borders plus the abolition of transfer payments might increase inequality in the U.S. or Germany but would surely reduce inequality on a global scale, the poor of India and Egypt, who would benefit, being much poorer than the poor of the U.S. or Germany. You are the only trash collector for your town. A recent change in state law has classified homeless people as trash and instructed all local trash collectors to kill homeless people and dispose of their bodies. You were appointed by an elected official who opposes the new law, so cannot easily be removed. Should you obey the new law, resign your position, or hold the position as long as you can while refusing to kill anyone?